Fifteen minutes before Swami Venkatesananda was to have addressed the meeting at the Avalon Theatre, the theatre was packed to capacity with people filling every available space. The foyer, the passages between the seats, alongside the walls and the gallery, together with the 1215 seats that were available must have taken a crowd or 2,500 to 3,000 men women and children. The 39-year old Swami spoke for 70 minutes without showing any sign of tiredness. He told the audience that South Africa was spiritually hungry and in the quest for spiritual happiness the people looked elsewhere to find it, rather than by “gazing within themselves”. Renouncing worldly goods and pleasures in order to find “true happiness” did not mean that man must throw away his wealth and possessions. “What we must cultivate is a spirit of detachment from worldly things as they belong to the world and not to man”, he said. speaking on the steps that led to God-realisation, the Swami said that the first need was to eradicate the egotistical nature within us. The ‘I-ness’ must be wiped out from our everyday life, and in its place must be taken a complete surrender of the self. Before we can become liberated yogis, we must first learn to be non-egotistic. We must renounce all our desires and attachment to sensual pleasures. People fear the very thought of renunciation because we haven’t learnt the real meaning of this term. It really means to renounce something that belongs to you. If one reflects a little, he will realise that nothing belongs to him, not even this body, for it is part of the earth to which it must eventually return. We must, therefore, renounce this sense of possession, this egotism. There is no need for us to run way from this world. Love and charity are also important steps in God realisation. 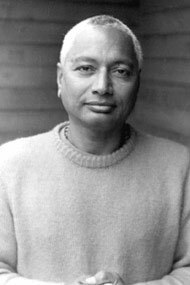 Swami Sivananda’s greatest mantra: ‘Give’. Practical work of a selfless nature is necessary to pulverise the ego, the bar to the kingdom of God. Spontaneous, overwhelming generosity which is the trait of swami Sivananda must be implanted in all. Vanity must be eradicated by surrender and humility.